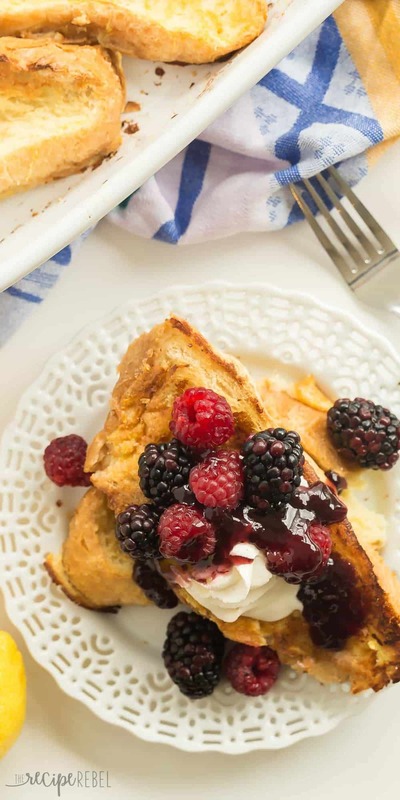 This Baked Lemon French Toast is so much easier than flipping French toast on the stove! It’s perfect for holiday gatherings, brunch potlucks, and Christmas gatherings! Top with fresh berries and whipped cream or yogurt for a special morning treat. Plus a recipe video. Make ahead breakfasts are possibly my favorite type of recipe. Who is with me? Because (a) although I’m a morning person, that doesn’t mean I want to spend an hour making breakfast, and (b) breakfast is the best meal of the day, so why not make it good? I have a couple variations of baked French toast (not French toast casseroles — although I have those too), like this Light Overnight Caramel French Toast and this Overnight Baked Pumpkin French Toast, and there’s a reason. I’m going to be honest, I think I like an overnight baked French toast even more than a French toast casserole. I just feel like the edges get crispier and it doesn’t just look like a big pile of slop on your guests’ plates. Though I’ve never been known to turn down French toast in any form. And it just doesn’t get easier! Anyone can handle throwing this in the oven in the morning (yes, even you!). 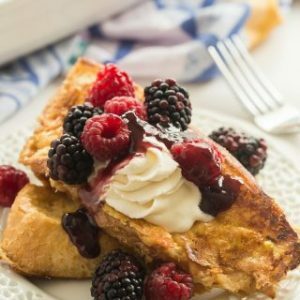 I had to make a lemon version of this French toast because I know how much we all love lemon here, and I feel like it goes perfectly with some fresh fruit and whipped cream or yogurt, which makes it a lighter version than most French toast casseroles (perfect for day after day of those endless holiday meals!). Friends, this might be my new favorite French toast. The lemon is just so light and refreshing, and with a dollop of whipped cream and some fresh berries (or berry sauce), it is just SO good. I can’t even handle it. And plus, lemon is one of those things that people enjoy as much in the summer as they do in the winter, right?? I know I do! 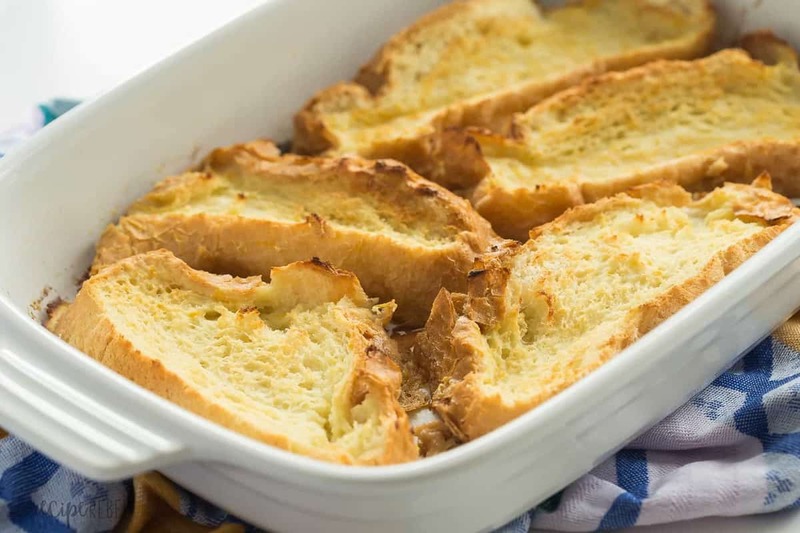 Because of the long baking time, I really, really recommend using a glass 9×13″ pan or ceramic casserole dish — a dark pan will cause the French toast to brown too quickly. You can make the original recipe in a 9×13″ pan, or double it up and bake it on a sheet pan (just make sure it’s a rimmed baking sheet!) if you’re having more guests! Just be careful that the edges of your sheet pan are deep enough to hold the liquid in — we don’t want no spillage! If you’re looking to experiment a little, try swapping out the lemon for orange and topping with raspberry or cranberry sauce. This Baked Lemon French Toast is so much easier than flipping French toast on the stove! It's perfect for holiday gatherings, brunch potlucks, and Christmas gatherings! Top with fresh berries and whipped cream or yogurt for a special morning treat. Lightly grease a 9x13" pan and place bread slices in a single layer (you can squish them a little if need be). In a large bowl, whisk together eggs, milk, sugar, zest and juice. Pour evenly over bread slices in pan (be careful not to leave too many dry sections). Cover with plastic wrap and refrigerate overnight or at least 2 hours. Remove plastic wrap and bake at 350 degrees F for 40-50 minutes, until golden brown and centers are set. Serve with whipped cream and fresh berries if desired. If desired, warm a little of your favorite berry jam to drizzle over top. 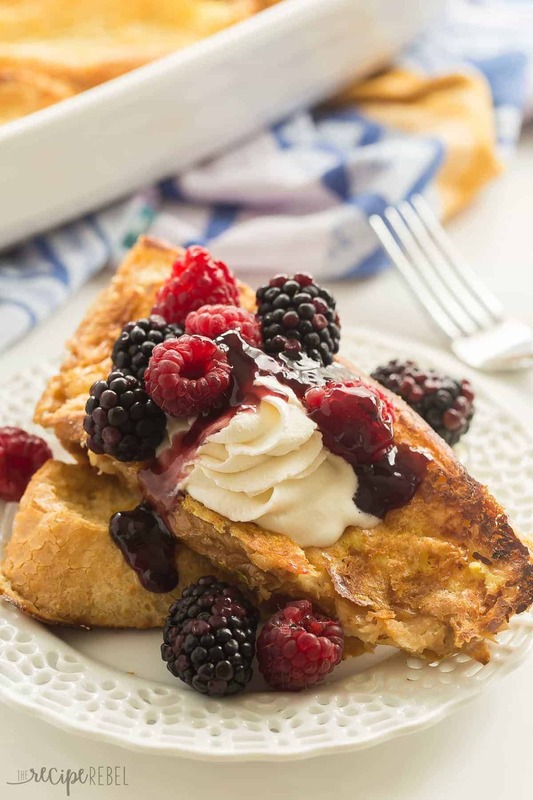 This Baked Lemon French Toast is so much easier than flipping French toast on the stove! It’s perfect for holiday gatherings, brunch potlucks, and Christmas gatherings! Top with fresh berries and whipped cream or yogurt for a special morning treat. Lightly grease a 9×13″ pan and place bread slices in a single layer (you can squish them a little if need be). If desired, warm a little of your favorite berry jam to drizzle over top. [br]**NOTE: Nutrition information is estimated and will vary depending on exact serving size, types and brands of products used. I do totally love lemon!! And I especially love it with berries. Def with you on that – breakfast is the BEST, though I am NOT a morning person. How do you do that? I wish I was one!! I’m dying at the “big pile of slop” comment 😉 This does looks delicious!! Perfect for holidays and guests! Haha! I will take my French toast ANY way believe me! Love the light lemon flavor! Perfect way to switch things up from the traditional heavier flavors and foods this time of year! Thanks Jessica! I was kind of surprised how much I loved it — but the lemon is so nice and fresh! Thanks Rachel! I totally agree — make ahead breakfasts are everything! Thanks Kelly! One of my favorite combos! 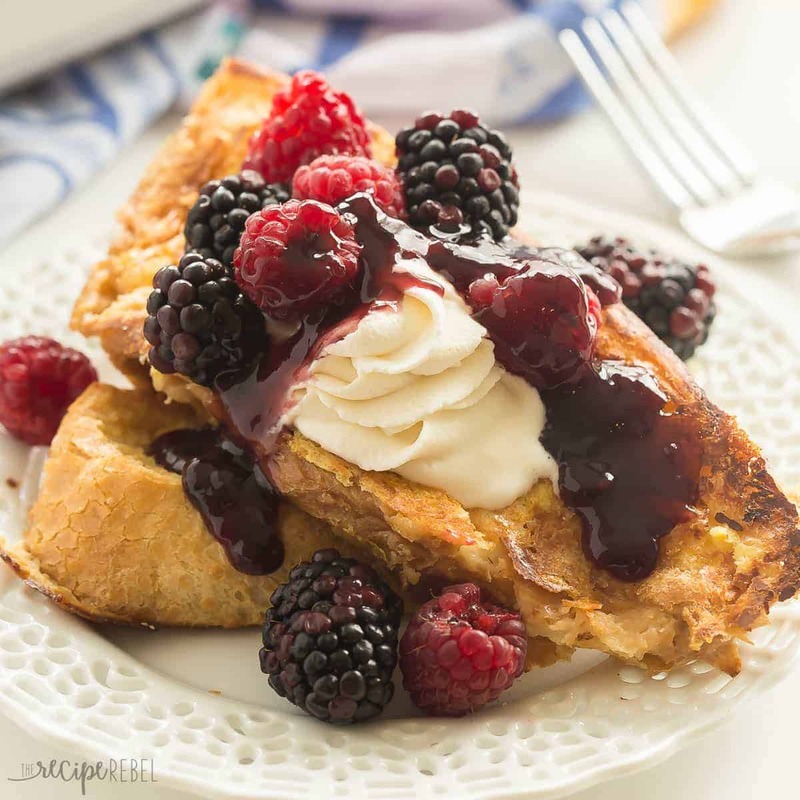 I love that the flavors in this baked french toast work year-round, so we can make it anytime! I’d definitely have to top mine with whipped cream and berries. I’m loving how delicious that looks in your photos! Thanks Kristine! I am definitely making it again soon. I love lemon! Make-ahead breakfasts are a must, especially during the holidays! And baked french toast is a favorite of mine because of how easy it is to prepare. Such a perfect meal to prep ahead and then wow your guests with! Love the lemon flavor in here, Ashley! Thanks Gayle! I love all things lemon!